As detailed below, the West Antarctic Volcano and Fault Belt, a continuous chain of active volcanoes and faults, is part of the very active Pacific Ring of Fire, the root cause of many anomalous changes in Antarctica’s ecosystems, oceans, climate, and ice masses. (Figure 1). 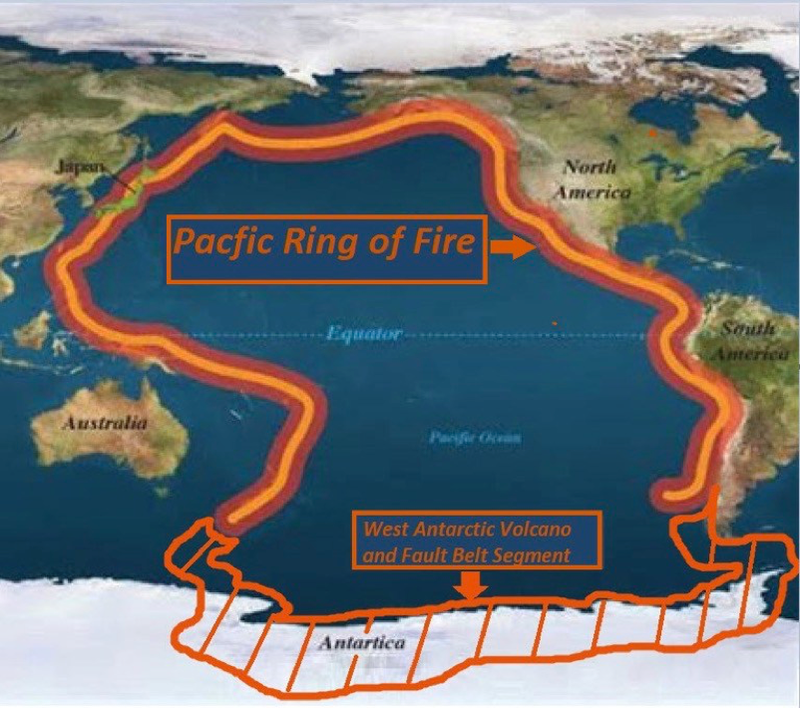 As currently defined the Pacific Ring of Fire is actually not ring-shaped, instead defined by geologists as “…a major area in…the Pacific Ocean where a large number of earthquakes and volcanic eruptions occur. In a horseshoe shape, it is associated with a nearly continuous series of oceanic trenches, volcanic arcs, and volcanic belts and plate movements.” (see here). The inclusion of the here-termed West Antarctic Volcano and Fault Belt into the Pacific Ring of Fire will raise scientific awareness concerning the idea, as per the Plate Climatology Theory, that geologically induced heat flow is the root cause of many anomalous changes in Antarctica’s ecosystems, oceans, climate, and ice masses. Let’s begin discussion of evidence supporting the above contentions by providing perspective concerning the currently defined, horseshoe-shaped Pacific Ring of Fire’s vast geographic extent and massive heat flow power. Here are a few numbers that may help. It is home to 452 active or semi-active volcanoes, an amazing 75% of the world’s total. It extends 25,000 thousand miles, making it the world’s longest and largest geological feature. Frequent movements along its numerous major faults account for 90% of earth’s earthquakes and 81% of the most powerful earthquakes. All but three of the world’s 25 largest volcanic eruptions of the last 11,700 years occurred at volcanoes located along the Ring of Fire. It encircles the world’s largest ocean, the Pacific, which accounts for 60% of earth’s surface and 48% of all ocean water. It is the sole heating source of 87,189,915,062 billion gallons of Pacific Ocean water. This geologically induced heating generates all El Ninos, the Earth’s most significant climate-altering phenomenon (see here and here). In the vernacular, the Pacific Ring of Fire is a beast! To qualify as a scientifically acceptable segment of thePacific Ring of Fire, the West Antarctic volcano and fault belt needs to clear three geological hurdles: contain an impressive number of active volcanoes, contain an impressive number of active faults, and connect in a geologically proper fashion onto the two currently defined horseshoe ends of the Pacific Ring of Fire. Reliable and abundant evidence proves that it clears all three hurdles. The West Antarctic Volcano and Fault Belt is home to 150 volcanoes, most illustrated on the Figure 2 map. Impressively, nine of the volcanoes are currently erupting or erupted in the last 12 months. All others are active or semi-active, none are dead/dormant (see here). The recent eruption of a subglacial volcano in the Deep Earth Molten Portion Lava (see Figure 2) portion of the belt was recorded by pure coincidence the result of a geographically limited research study (see here). This subglacial eruption is strong proof that sub-glacial volcanic activity is likely occurring across the remaining larger and almost completely unmonitored regions of West Antarctica. Just-released research by the National Aeronautics and Space Administration (NASA) confirms the presence of a subglacial, shallow bedrock, and 620,000-square-mile magma chamber termed a Mantle Plume located beneath a significant part of West Antarctica (see here, here, and here). This feature flows enormous amounts of ice melting heat onto the base of many West Antarctic Glaciers (see here). The backbone of the West Antarctic Volcano and Fault Belt is a 5,300-mile-long and deep earth reaching major fault system that is literally ripping Antarctica apart, the West Antarctic Rift (see here, here, here, here, and here). A major fault system that stretches across the continent, into adjacent oceans, and is expressed at the bedrock surface as a variety of fault-induced features: mountains, valleys, volcanoes, and seamounts. The West Antarctic Volcano and Fault Belt stretches across the entire Antarctic Continent and extends into adjacent oceans where it conformably attaches to matching geological features of the two currently defined Pacific Ring of Fire horseshoe endpoints. Figure 2: Outline of the West Antarctic Volcano and Fault Belt (red hatched) and its associated volcanoes (yellow triangles), faults (black dashed), and deep earth molten lava chamber (black hatched). Horseshoe ends of the currently defined Pacific Ring of Fire are shown as dark orange lines. Additionally, modern-day anomalous ice melting on the Antarctica continent is limited to the West Antarctic region. The absence of significant ice loss, and by some studies ice gain, in East Antarctica is strong evidence that geological heat flow from the West Antarctic Volcano and Fault Belt, and not atmospheric global warming, is the cause of West Antarctic Ice loss. Recent research has shown that ancient pulses of heat from the West Antarctic Volcano and Fault Belt acted to melt significant portions of the West Antarctica ice sheet. This melting set off a series of events that rapidly and dramatically altered the southern hemisphere’s climate (see here and here). Changes in historical surface temperatures (see here). Acceleration of glacial grounding lines from geologically warmed ocean waters (see here). Infusion of seafloor’s hydrothermal vent-induced mercury into glacial layers (see here). Figure 3: The foreground is West Antarctica’s currently erupting 12,448-foot-high Mount Erebus volcano and in the background is the active 10,597-foot-high Mount Terror volcano. These massive volcanoes are part of the West Antarctic Volcano and Fault Belt. In summary, significant amounts of reliable information have proven beyond any doubt that West Antarctica is home to many actively high-heat geological features. Scientists, especially those advocating the man-made theory of global warming/climate change, have failed to recognize that these features are part of an interconnected, active, and very powerful geological system here termed the West Antarctic Volcano and Fault Belt. A geological system that is an integral segment of the Pacific Ring of Fire.